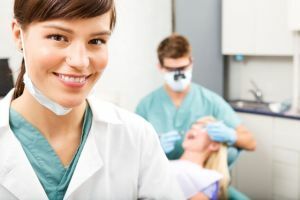 Fluoride treatments have been used by dentists to help prevent tooth decay by adding resistance against acid attacks, plaque bacteria and sugars in the mouth. Fluoride is an important tool in the prevention and reversal of decay. The goal of a properly implemented fluoride treatment is to keep teeth strong and healthy. Our fluoride treatment uses a sodium fluoride varnish because it sticks to the tooth longer and provides a more thorough protection. The treatment that takes place in the dental office is of a higher percentage than what is found in municipal water, toothpaste and OTC rinses.